Our Stevens Storm Surge Warning System have been predicting flood elevations about a foot below the observations, so take this as a low-end estimate, but here are those predictions. Also plotted are NOAA’s ET-SURGE predictions, which have a similar estimated peak water elevation for The Battery and a lower one for Kings Point. Also, the storm is apparently strengthening, so this will likely be revised upward as the afternoon progresses – the next forecast update is at 4:30pm. 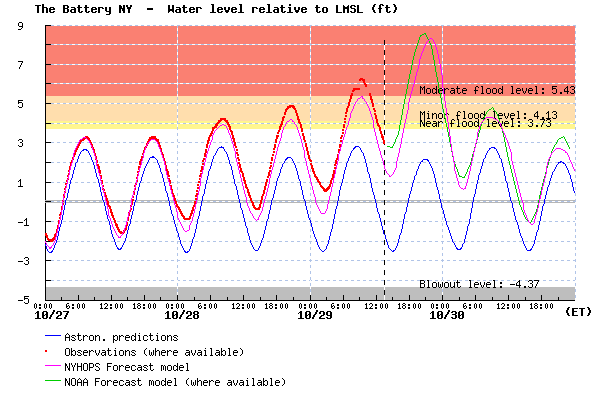 Stevens NYHOPS Storm Surge Warning System forecast for water levels at The Battery in New York Harbor (magenta), relative to mean sea level (LMSL). Predicted tides are also shown (blue), as well as observed water levels and the NOAA ET-Surge forecast for comparison (green). Add 2.6 ft to heights at The Battery to get MLLW reference (average daily low tide). 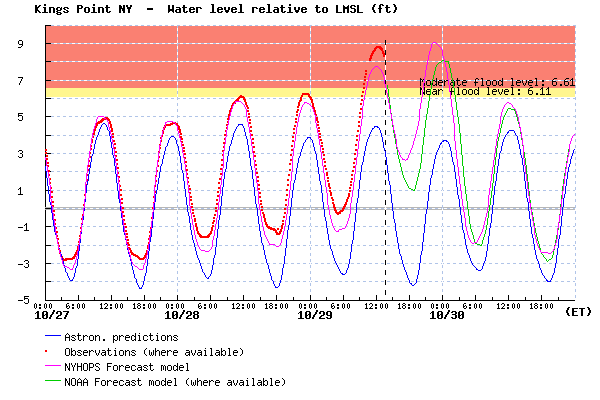 Stevens NYHOPS Storm Surge Warning System forecast for water levels at Kings Point in Western Long Island Sound (magenta), relative to mean sea level (LMSL). Predicted tides are also shown (blue), as well as observed water levels and the NOAA ET-Surge forecast for comparison (green). Let’s hope these model predictions are the highest we see. These figures nicely illustrate the time-dependence of the problem — when the high tide and peak water levels hit, as well as how the tides are crucial to the floods — at Battery, the current timing of the peak surge (and basically, storm landfall of NJ) is at high tide. At Kings Point, the forecast is for the peak surge to come before high tide, so water levels are not as likely to break records. This entry was posted in water, weather and tagged evacuation, forecast, Frankenstorm, gale, harbor, hurricane, Long Island Sound, predicted, Sandy, storm surge, storm tide, tide, water elevation. Bookmark the permalink.